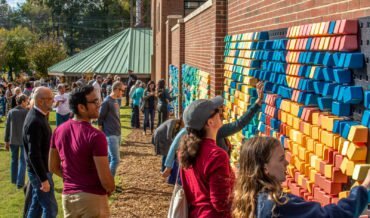 DURHAM, N.C. – The Liberty Warehouse Wall at Durham Central Park will soon have new interactive public art on display and the Durham community is invited to the early November opening ceremony. 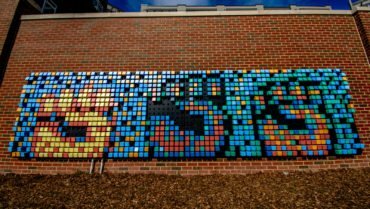 Hosted by the City of Durham and Durham Central Park, the opening ceremony will take place on the east side of park, which is located at 501 Foster St., on Sunday, November 4 at 2 p.m. At this event, community members will have the opportunity to meet the artist collective behind the mural, Pixel Patch Creative, and create pixel murals of their own. 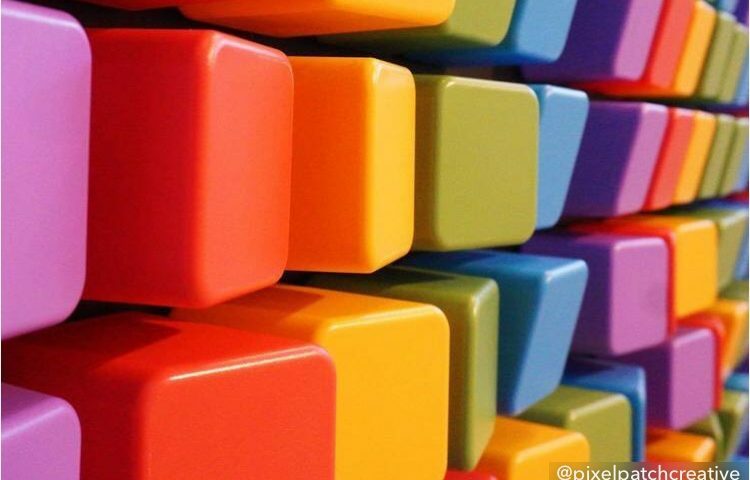 The Opening Ceremony will take place alongside the Durham Central Park Food Truck Rodeo, and marks the second major public art installation along the Durham SmART corridor. 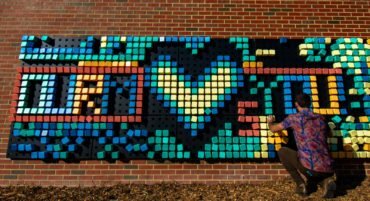 The public art installation, titled A Story Goes On, was created to facilitate an interactive, engaging artistic experience in the heart of downtown Durham in which visitors are encouraged to create murals using movable pixel blocks. To celebrate the region’s incredible artistic legacy, The Story Goes On, provides space for emerging creative visions and pays particular tribute to local visionaries and thought leaders who have used their craft to advance social change. Durham Central Park, Inc., Liberty Warehouse Apartments, and the City of Durham Office of Economic and Workforce Development, General Services Department, Durham Parks and Recreation, Public Art Committee, and the Artist Selection Committee selected Pixel Patch Creative as the artist team to design and install public art for the Liberty Warehouse Wall. This selection followed a participatory review process of 104 artist applications from across the United States responding to a national call for qualifications released in September 2017. For more information about this public art installation or its opening ceremony, contact Special Projects Manager Stacey Poston with the City’s General Services Department at (919) 560-4197, ext. 21254 or by email. Pixel Patch Creative is an artist collective founded to promote inclusive community engagement. Their work is hosted in public spaces to support place-making, tactile interactions, and multi-layered dialogue. Pixel Patch Creative design simple tools so communities have accessible ways to express themselves creatively. For more information, follow on Twitter and Instagram. 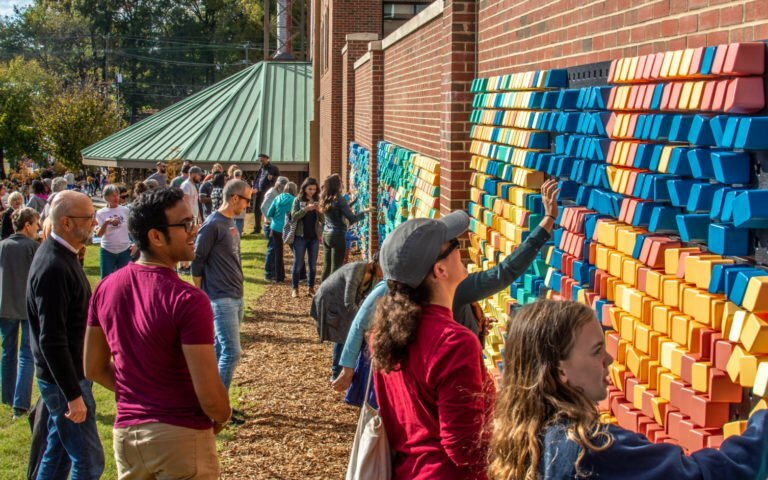 In 2012, the City of Durham was selected as one of five cities in North Carolina to participate in the 2012 North Carolina ArtsCouncil’s SmART Initiative to demonstrate how creative placemaking revitalizes downtowns and fuels sustainable economic development. The Durham Arts Council, in partnership with the City of Durham, Durham County, and multiple private partners and community stakeholders, worked with award winning landscape architect and urban designer Mikyoung Kim, creating a SmART Vision Plan, which reimagines the rapidly transforming north-south corridor straight through downtown. For more information, visit https://www.smartdurham.org. About Durham Central Park, Inc.
Durham Central Park, Inc., is a 501(c)3 organization that holds a management agreement to operate, develop, and program Durham Central Park, a five-acre, City-owned park in downtown Durham. 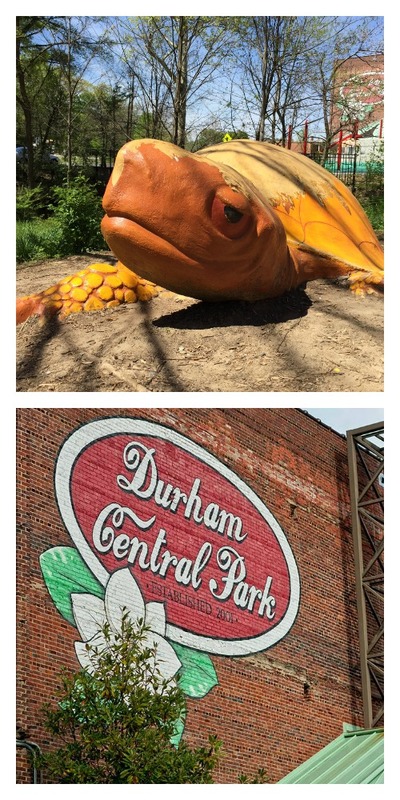 Durham Central Park features numerous gardens, paths and benches, open fields, kids play area, climbable sculptures, a skate park, and a large pavilion that is home to the farmers’ market and other community events. For more information, follow on Facebook, Twitter, and Instagram. The General Services Department builds and maintains City properties to make Durham a great place for people to live, work, and play. Guided by the City’s Strategic Plan, the department’s core functions include the acquisition and sale of properties, design and management of new construction and renovation projects, building maintenance, landscaping and urban forestry services, cemeteries management, sustainability and energy management, cultural and public art program management, and supporting the nonprofit Keep Durham Beautiful. The Public Art Committee serves as an advisory body to the Durham City Council and the City Manager, and its functions include assisting the City’s Office of Economic and Workforce Development on matters relating to public art; implementation of the Public Art Policy; and reviewing proposals for public art projects brought to it by the City administration; and making recommendations to the Cultural Advisory Board regarding project approvals. To further help artists connect with opportunities, the City has aDurham Calls for Artists page on its website, which lists a number of upcoming opportunities for artists in and around Durham. Artists and other stakeholders who would like to be notified of current and future art-related opportunities and news can now sign up for alerts through the Cultural and Public Art mailing list. For more information about the City’s Public Art Program, visit the City’s public art web page. 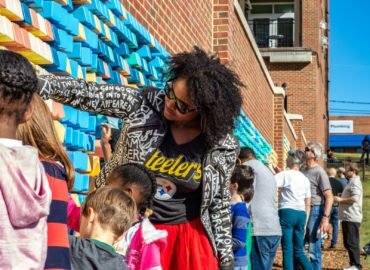 Artists interested in more information about the Public Art program may also contact Special Projects Manager Stacey Poston with the City’s General Services Department at (919) 560-4197, ext. 21254 or by email. Volunteer WASTE WARRIORS receive incentives! What does a Waste Warrior do? Did you know that it’s been almost a year since Mt. Merrill officially opened?! Every Saturday, it is teeming with children running up the hills and zooming down the slides, thoroughly enjoying the outdoors. Even on weekdays, families play there with home-schooled children or teachers with groups of children from nearby schools or the YMCA. They love it, as you can see here on our Flickr page. Our goal is $20,000.00 and we hope you will consider making a gift to keep Durham Central Park a place where everyone can enjoy the great outdoors. Donations can be made online at Durham Central Park’s secure web site www.durhamcentralpark.org/donate/ or by mailing a check to PO Box 1526, Durham, NC 27702 with Mt Merrill in the memo line. Mt. Merrill was built on community support. It is named in memory of Merrill Davis, the son of George Davis from Stone Brothers and Byrd. During his lifetime, Merrill loved and supported DCP. He got the grass to grow in the terribly hard soil after the Pavilion was built, he got married in the Park, and was always willing to pitch in and help build the park you know and love today. After Merrill died tragically in a car accident in 2012, the community came together, through donations large and small, to build this one-of-a-kind play area in his honor. If you haven’t had a chance to visit and enjoy Mt. Merrill, we hope that you will visit sometime soon. It’s fun for kids of all ages! Even our Executive Director is known to run up the rocks and slide down the slide from time to time. Thank you for considering supporting and enhancing Mt. Merrill and Durham Central Park. Play on! Building Mt. Merrill, the interactive, handicap-accessible climbing mound, has also become a community effort in terms of gathering donated and recycled materials. “Stone Brothers & Byrd is donating trees and plantings, and local sculptor Al Frega is donating benches” says DCP Board chair Lee Ann Tilley. Thank you April 26 Durham Central Park Workday Crew! 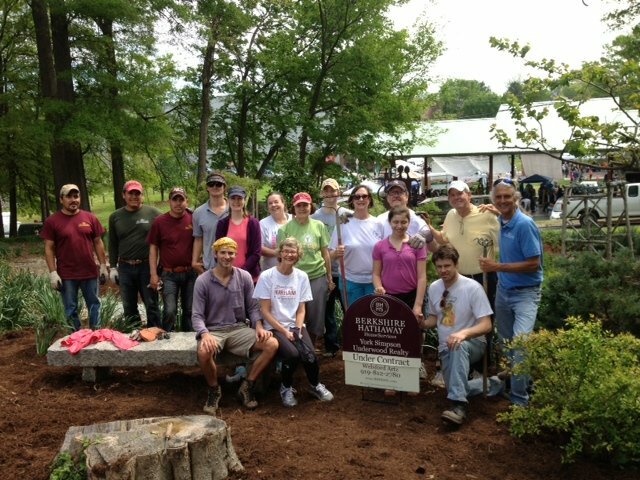 Shout out and BIG thank you to Tracey Goetz and Sarah Artz and all the Berkshire Hathaway Home Services/York Simpson Underwood Realty group and Old North State Landscaping (Will and Ben Lang and their crew) for a great workday at Durham Central Park on Saturday morning, April 26! They brought tons of mulch, new hostas and a beautiful Japanese maple to spruce up their garden in the south west corner of the park. Take a gander behind the Pavilion, beside the Measurement Inc parking lot. These folks are a wonderful example of how Durham Central Park is a REAL community effort! We could not do it without you! 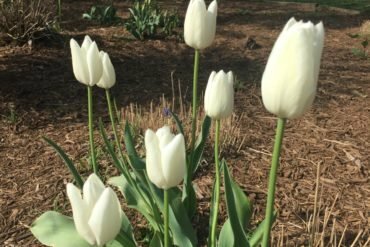 Come see the garden…it’s beautiful! 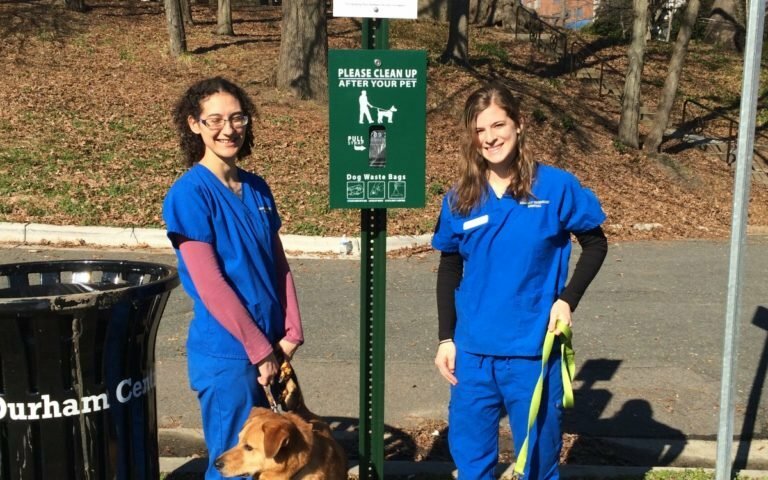 ​Durham Central Park now has a new dog waste bag station, thanks to Broadway Veterinary Hospital! They are downtown Durham’s first vet, offering veterinary care primarily for dogs and cats. They also offer acupuncture to help treat chronic pain conditions and other medical disorders. There is a new sculpture on display in Durham’s Central Park. The seven foot, 1500 pound steel sculpture, called Reunion, resembles an intricate woven basket. It was created by Michael E. Waller, a sculptor with Liberty Arts Non-Profit Sculpture Studio and Foundry. Getting the sculpture placed was a collaborative effort between Durham Central Park, Durham’s Cultural Advisory Board, the Parks and Recreation Department, the Office of Economic and Workforce Development and Liberty Arts. Durham’s Five Points, an original contender for Reunion’s site, fell through but Frank Konhaus, of the Cultural Advisory Board contacted Durham Central Park’s Executive Director, Ann Alexander, because he felt Durham Central Parkwould be a perfect temporary home. “Parks and Recreation, Planning, Engineering, Transportation and Stormwater Management all moved with incredible speed to get this reviewed and approved in less than 4 days” says Peter Coyle Senior Economic Development Coordinator at Durham’s Office of Economic and Workforce Development. Collaboration continued as Reunion was brought directly from the Sculpture in the Garden show at the NC Botanical Garden in Chapel Hill, in sculptor Wayne Vaughn’s truck, free of charge. Michael Waller is loaning Reunion to Durham Central Park free of charge. Waller, a member of the Liberty Arts group, has been a professional sculptor since 1997 after earning a BFA in Sculpture at East Carolina University. Reunion will be on display until May 1, when it will be replaced with a sculpture juried in the the upcoming Bull City Sculpture Show. Durham Central Park will host multiple, large, dynamic pieces from throughout the U.S. during the show. You can find out more about the Bull City Sculpture Show at www.bullcitysculptureshow.org.